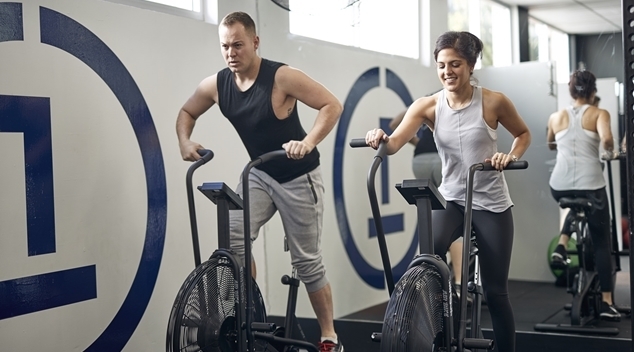 If you’re feeling run down and exhausted from a busy work week, you better give ONE Fitness Health Lifestyle’s Party Pump Super Circuit a go. Held on Saturday mornings at the Subiaco gym, this class is an awesome way to give you a fresh wave of energy for the best days of the week. Good beats? Check. Adrenaline pumping? Check. Puppy cuddles? Also check. What more do you need for your Saturday morning sweat? ONE FHL offers a range of group fitness classes from boxing, to yoga, HIIT to TRX workouts, a buffet of exercise options, if you will. Recently I tackled the infamous Party Pump Super Circuit. The class is held on Saturday mornings, aiming to help you get into the weekend spirit nice and early. Walking into class I came face to face with bikes, dumbbells, kettlebells, ropes and weight plates, plus little grey and white dog Tex. If you’re an animal lover, this is the gym for you. After a quick rundown about the circuit, you pick a station, give Tex a few pats, and then the timer starts. The circuit is a full body workout. Your abs, legs and arms will be burning by the time you’re through with it. In between weight stations, there’s some plyometrics thrown in (think burpees and jump squats), and any cardio bunnies out there will love the laps around the block and bike sprints. You will get sweaty during this workout, but you won’t realise how exhausted you are until it’s over. The class moves super quick from station to station, from upper body to lower, cardio to weights. The point of difference for a class at ONE is the community. ONE-goers come from all different walks of life, but as soon as you step into the gym it’s like one big happy family. The welcoming environment has prospective members always coming back for more. It’s not just about breaking a sweat, it’s about breaking a sweat surrounded by your friends. If you’re someone who needs that extra motivational push, get yourself to a class at ONE. Not only will you get your heart rate up, you’ll probably be inducted into the gym’s unofficial brunch club. Nothing better than bacon and eggs with mates on Subiaco’s coffee strip after class!